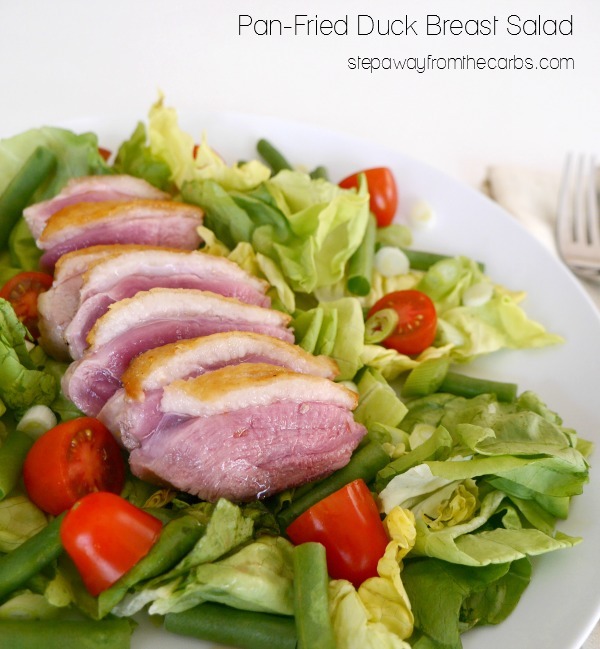 This low carb salad features a beautifully pan-fried duck breast! 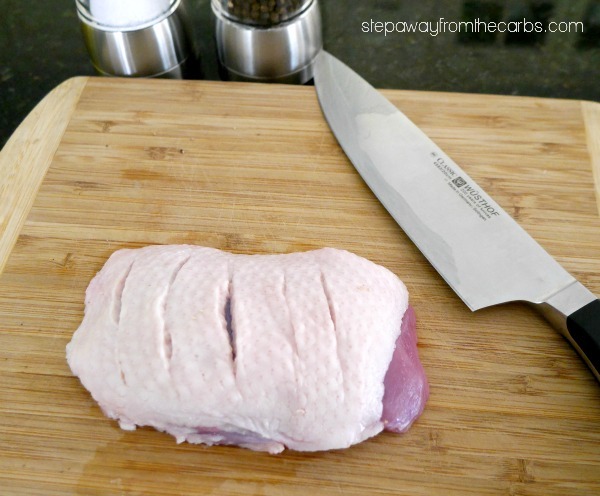 I think this is the first duck recipe on the blog! Duck breasts are much easier to buy in the UK (where I used to live), and ever since seeing my friend Keith’s method of perfectly pan-frying the duck over on Life Is A Cabernet, I have *really* wanted to eat them again. 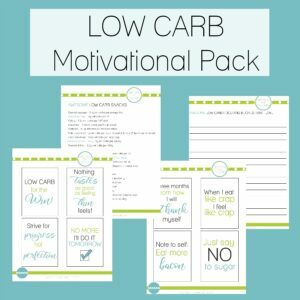 Actually, if you like Broadway and musical theatre you should check out the blog anyway – the puns are hilarious – although not all the food is low carb. 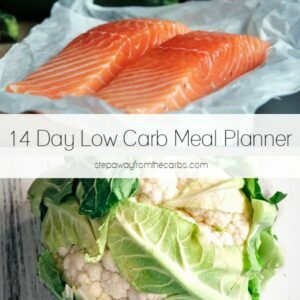 It cost me $10 for one duck breast where I live now – although I’m sure that in other areas it would be cheaper! In the UK you can buy four frozen duck breasts for the equivalent of about $5! So right now this is definitely a special treat meal in our home! 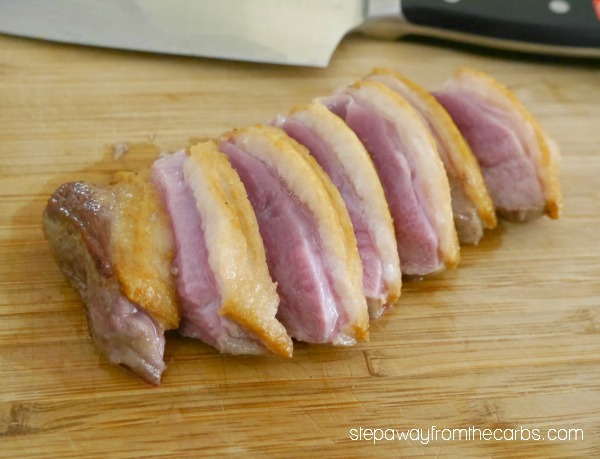 For me, the best-cooked duck breast needs to have the skin on – but cooked until crispy – then rare in the middle. My WÜSTHOF Classic 8″ Über Chef’s Knife was perfect for scoring the skin – get one of your own from Sur La Table, Williams-Sonoma, Bed, Bath & Beyond or Crate and Barrel! I decided not to complicate this special treat, and serve the duck unadorned on a bed of butter lettuce, grape tomatoes, raw green beans and finely chopped green onions. I didn’t dress the salad because I wanted it to be all about the duck, but I kicked myself afterwards because my low carb blackberry vinaigrette would have been ideal! I followed the instructions in his recipe precisely, and the duck was even better than expected. 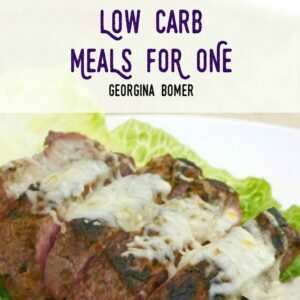 If you want to try this method, please check out my friend’s recipe on Life Is A Cabernet! 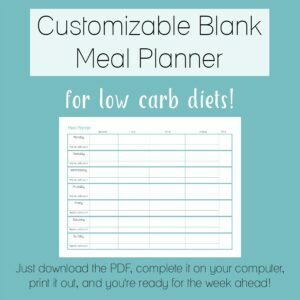 The duck itself doesn’t contain any carbs, so you’ll just need to add up the carb count of your salad items and dressing if you use one!